Kyle is now up to 50 mph per the last NHC advisory. That looks like a reasonable estimate, with the strongest winds in the convection to the east. 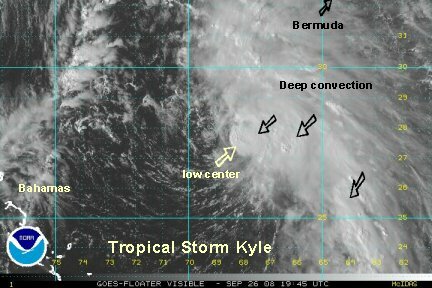 Kyle is still being sheared some and will strengthen as this wind shear begins to weaken. There is a decent chance that Kyle will strengthen into a hurricane in the next 24-36 hours. Kyle will pass west of Bermuda Saturday. It should pass close enough to bring rain, gusty winds and increasing surf on the southern shore. It will then pass east of Cape Cod Saturday night into Sunday. 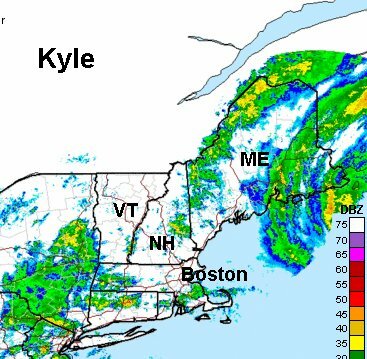 Kyle may be a hurricane at this point and bring similar or stronger effects to coastal New England. Models generally pass Kyle about 50-100 miles east of Cape Cod and have it making landfall Sunday afternoon in Nova Scotia or Downeast Maine. Interests in the Northeast U.S., eastern Canada, and Bermuda should follow this system closely. Tropical storm Kyle is struggling against wind shear at this time. Officially the wind is at 60 mph. This wind was extrapolated from 850 mb (about 5000 feet). The recon estimated a surface wind of 52 mph. We think 50 mph is still more representative of the speed. 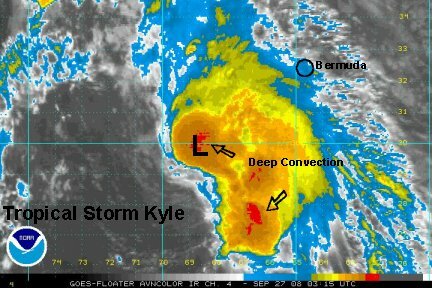 We are beginning to wonder if Kyle will make hurricane strength. It is still possible, but it has a lot of shear to overcome. Kyle will pass west of Bermuda Saturday. It should pass close enough to bring showers, gusty winds to around 25-30 mph and increasing surf on the southern shore. It will then pass east of Cape Cod Saturday night into Sunday. Kyle <i>may</i> be a hurricane at this point and bring or stronger effects to coastal New England. There will be a significant difference in the effects to Cape Cod if passes 50 miles east instead of 100 miles east. this will be especially true <i>if</i> tropical storm Kyle becomes a hurricane. Models generally pass Kyle about 50-100 miles east of Cape Cod and have it making landfall Sunday afternoon in Nova Scotia or Downeast Maine. It looks like the shear has weakened just a bit as the circulation center is now back under the ball of deep convection. It also appears to have strengthened some. By strengthening, we mean from our earlier estimate. NHC has kept tropical storm Kyle at 60 mph. We thought that the 60 mph wind was too strong. The last Hurricane Hunter recon has a 1003 mb pressure with a 35 knot surface wind and a 56 knot flight level wind. The estimate of 60 mph sustained wind is still probably a bit high, especially at 1003 mb. Right now 50-55 mph is probably good. 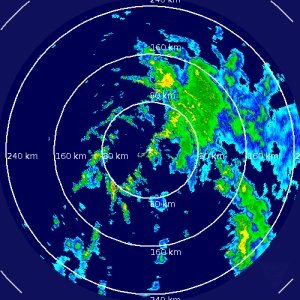 Kyle will pass about 250 miles west of Bermuda Saturday. It should pass close enough to bring rain and winds to around 25-30 mph. Gusts are possible to 45 mph or a little higher. Expect increasing surf on the southern shore. An inch or two of rain is possible. Kyle will then pass east of Cape Cod Saturday night into Sunday. 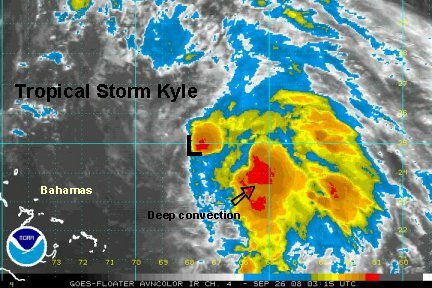 Kyle <i>may</i> be a hurricane at this point and bring effects to coastal New England. The latest forecasts suggest a little farther east from 100-150 miles east of Cape Cod. Models have landfall late Sunday afternoon in Nova Scotia or Downeast Maine. NHC upped Kyles wind speed to 70 mph on the 11pm edt advisory. The recon reported a 998 mb pressure on the 8pm fix. Pressure on the 2 am advisory now is at 994 mb. We still think that NHC is a bit high on the winds. Usually hurricane strength occurs closer to a 980 mb pressure. Our estimate is 60 mph sustained winds. It seems recently over the past few years that NHC reports the strongest surface winds as the wind speed instead of the strongest surface sustained winds which are lower. The low is now under deep convection, although westerly wind shear is still playing a role in Kyle only slowly strengthening. There is very little to report in forecast changes. The new models are almost exact from the previous run, except about 6 hours slower. 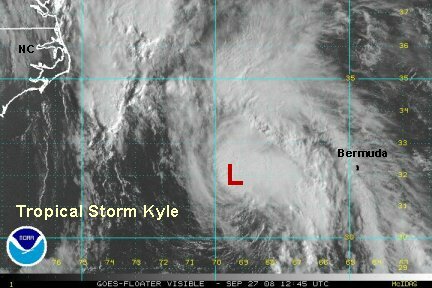 Kyle will pass about 250 miles west of Bermuda Saturday. It should pass close enough to bring rain and sustained winds to around 30 mph. Gusts are possible to 45 mph or a little higher. Expect increasing surf on the southern shore. An inch or two of rain is possible. Kyle will then pass east of Cape Cod Sunday. 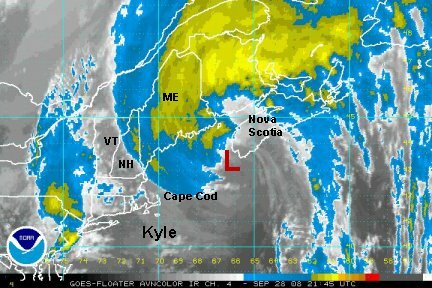 Kyle <i>may</i> be a hurricane at this point and bring effects to coastal New England. The forecasts still have Kyle passing 100-150 miles east of Cape Cod. Models have landfall Sunday evening in Nova Scotia or Downeast Maine. Eastern Massachusettes and Maine may see winds sustained at 40 mph and gusts to 60 mph or possibly stronger. Rainfall over the next 48 hours will be in the 2-5" range. The visible satellite imagery shows that Kyle is better organized. 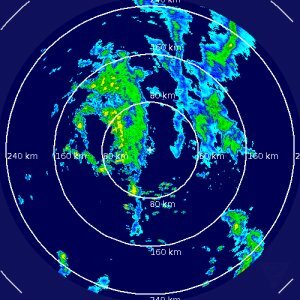 It is still asymetrical with the southwest quadrant void of convection due to wind shear. It is possible that NHC will call it a hurricane at 11 am AST. We think that it is weaker and not at hurricane strength yet. Especially with the pressure as high as it is. We think that tropical storm Kyle is about 65-70 mph. It is going through a strengthening phase and may actually become a hurricane later today (by our estimate). The hurricane center will likely upgrade to a hurricane either on the next advisory or this afternoon. Tropical strom Kyle will lose some strength before landfall due to the very cold water temperature near Canada. Winds have increased to 30 mph with a gust to 41 mph. This is with an outer squall band. A much heavier band will pass about 50 miles west of the Island. So, far only .11" of rain has fallen as of this morning. Less than an inch will probably fall unless the heavier rain squall nips the Island later today. Kyle will then pass east of Cape Cod Sunday. 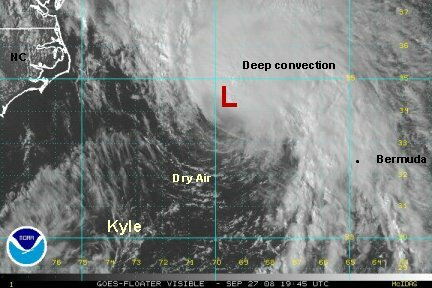 Kyle <i>may</i> be a hurricane at this point and bring effects to coastal New England. The most recent forecasts have shifted a litlle west bringing Kyle 75-125 miles east of Cape Cod. Models have landfall Sunday evening in Nova Scotia or Downeast Maine. Kyle is now at 75 mph per the 5 pm ast advisory. 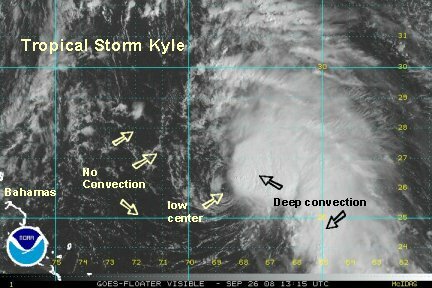 Kyle has been organizing today and we think that it is also now close to hurricane strength. There is still just a bit of southwesterly shear exposing the southwest circulation. Bermuda still may see a few rain squalls this evening, but the worst will be over by later tonight. Kyle should pass to the east of Cape Cod during Sunday afternoon. Winds may be around 40-50 mph with gusts around 65 or a little stronger. 1-2" of rain is possible in eastern Massachusetts and 2-5" for the central and eastern Maine coast. 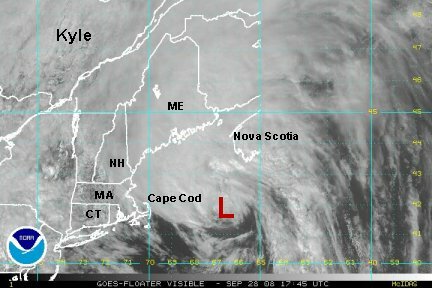 Hurricane Kyle will likely be a strong tropical storm before landfall in southern Nova Scotia or extreme eastern Maine. It will lose some strength over the cold north Atlantic water. Some winds could gust near hurricane force. Interests in the Northeast U.S., eastern Canada hould follow this system closely. Hurricane Kyle has not changed much since our last update. Top sustained winds are 75 mph. The Hurricane Hunters did find slightly stronger winds Saturday afternoon to finally substantiate the 75 mph surface sustained winds. Pressure remains high at 995 mb. Kyle is centered 355 miles south of Nantucket as of 11 pm edt. It is likely to make a slight curve to the nne from its northern bering now. 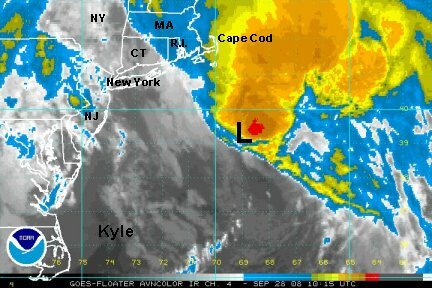 The forecast still takes Kyle about 100 miles east of Cape Cod and should be due east of the Cape around noon Sunday. Landfall continues to point to somewhere inbetween Downeast Maine and southern Nova Scotia late tomorrow evening. The strongest effects will occur on the eastern side of the circulation, so the eastern coast of Nova Scotia will catch the worst of Kyle. Some weakening is expected, so Kyle will make landfall most likely as a strong tropical storm. 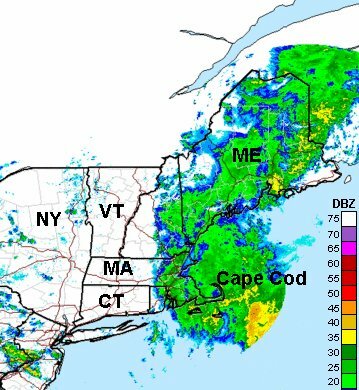 Rainfall amount of 1-2" are possible on Cape Cod, and 2-5' from the central Maine coast eastward to southern Nova Scotia. Kyle is now racing northward at 24 mph centered about 205 miles sse of Nantucket at 5 am edt. It appears that there is a transmission problem with the Hurricane Hunters data. 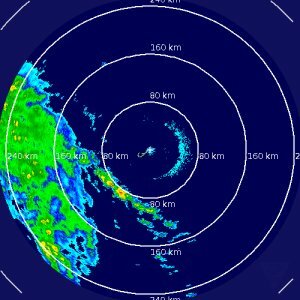 NHC is still getting the reports though. On last night's mission, a surface pressure of 996 mb was extrapolated. This is NOT a hurricane with a pressure that high, with a surface wind estimate of 52 knots. The hurricane center mentioned that in the post analysis that it may be down graded. The surface wind max also was not near the flight level wind max. This tells us that the system is extremely tilted and is becoming extratropical. 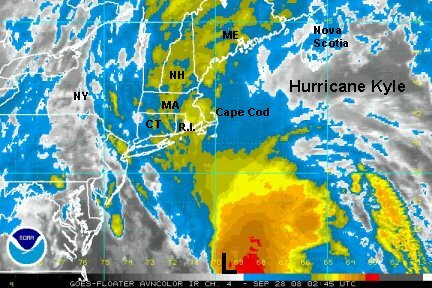 Landfall is still expected this evening inbetween Downeast Maine and southern Nova Scotia. Heavy rain continues to move toward Maine. Doppler estimates 1-2" in on Cape Cod, with some totals around 3". It's hard to tell what rain fell as a result of Kyle and what fell with the front preceding Kyle. 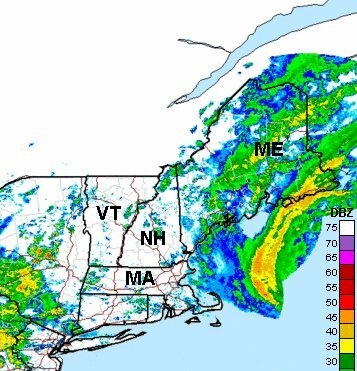 The heavy rain will head across Maine and into Nova Scotia. Rainfall Totals are still expected to be in the 2-5" range. After searching bouy data it appears that seas are generally running around 8-10' off of the New England coast. Winds were not very strong either - around 20-25 mph. Granted the winds are higher near the convection burst. To summarize: buoy, recon data and satellite imagery show a deteriorating storm. We think that the max sustained surface winds are probably near 55-60 mph near the convection burst. Cape Cod probably won't see winds much higher than 40-45 mph in gusts. the Hurricane Center upped the wind to 80 mph. We are astounded by this. The Hurricane Hunter surface pressure estimate was 991 mph. The flight level wind was extrapolated to give the 80 mph surface wind. This is not a totally tropical system and flight level winds are not representative of what you'll find at the surface as you would in the tropics. The recon most likely measured stronger winds aloft with the jet. None of the buoys are remotely confirmiing this type of wind. A hurricane of 80 mph <i>sustained</i> winds should have gusts to 90-95 mph. NHC has Kyle still at 80 mph for the last advisory. We still contend that it is not a hurricane, but a tropical storm which is becoming extratropical. The Hurricane Hunter recon at 8 am this morning did find a 77 knot surface wind. That was probably under a downburst. Right now a buoy 170 nm east of Hyannis, MA measured a 36' sea with wind of 61 mph / gusting to 81 mph. This buoy was also near the exact center of Kyle. This should be representative of how it should be classified: top sustained winds of 60-65 mph. As we mentioned in our earlier update if Kyle is an 80 mph hurricane, then wind gusts to at least 95 mph should be found. Microwave satellite estimates recently showed 51-55 knots, confirming that this is not really a hurricane. Kyle is on track to make landfall on the southwestern tip of Nova Scotia around 8-9 pm edt tonight. The worst of the weather is moving through downeast Maine, with heavy rain. The strongest winds with gusts to near hurricane force will come in this evening. Earlier we thought that the worst of the weather would move into eastern Nova Scotia. This time dry air has wrapped around the center onto the eastern side, so don't look for the heavy rain east of the center. Kyle will be making landfall shortly. It appears more like a mid latitude occlusion than a hurricane. 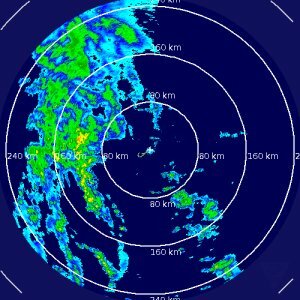 The center is about 1-1 1/2 hours from making landfall on the extreme southwestern tip of Nova Scotia. Solid rain continues in Downeast Maine where up to 3" of rain has already fallen. Most of the rain is from Rockland northward. Seas were at least 14' with winds at 40 knots gusting to 54 knots recently where Kyle passed over a buoy. The other buoy that reported a 36' sea is now down to 18'. Seas closer to the coast of Maine are in the 5-8' range. The strongest winds were near 45 mph at this time. Look for seas to subside and winds to slacken after the next 3-6 hours. Officially Kyle is at 75 mph. As per the other advisories, we think that Kyle has weaker top sustained winds. Probably closer to 60 mph with some higher gusts. This will be the last update on Kyle.